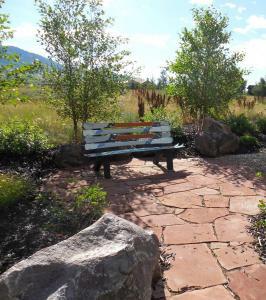 This garden has been installed for about ten years now, and was one of the earlier gardens we designed in Utah. The home was beautifully sited by the architect, Mark Bates, to take advantage of amazing views, while at the same time working with the gently sloping site. It is barely visible from the road. Equally great care was taken to marry this home to the gardens, and then to the high desert landscape beyond. Bold drifts of ornamental grasses, drought tolerant perennials in earthy tones, and native shrubs and trees surround the property and only get lovelier and lovelier as the seasons progress. 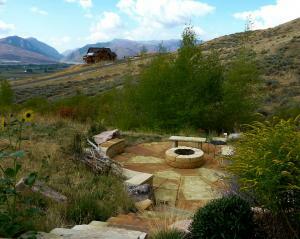 Locally quarried stone steps, patios and fire pit unite the garden spaces and fit in really well with topography. An gorgeous, glass tile spa fits twelve and is perfect for this vacation getaway home. A multi level site, limited irrigation water and a desire to blend into the surrounding native landscape dictated the landscape design for this home with stunning views. Local blond sandstone ties the areas together with seat walls, a stunning sunburst patio using two different colors of stone, a custom fire pit and the incredible stone slab mailbox. A boardwalk winds through the front garden to the lower, back garden. The vast majority of the rather large lot is reseeded in drought tolerant grasses under native maples and aspen. Planting nearer the home are also drought tolerant and reflect the changing moods of the seasons. Mass plantings of buff, sage, silver, and green (Russian Sage, Little Blue Stem grasses, daylilies, yarrow, Autumn Joy Sedum, Blue Fescue Grass, Karl Foerster grass, as well as junipers, maples, alder, spruce) allow this home and garden to seamlessly blend with the surrounding hillside. Watering is limited to once every week and a half, even in the hottest summers. Only the areas closest around the home where landscaped, leaving as much native landscape (sage brush, chokecherry, grasses, Big Tooth Maple, Utah juniper) as possible.